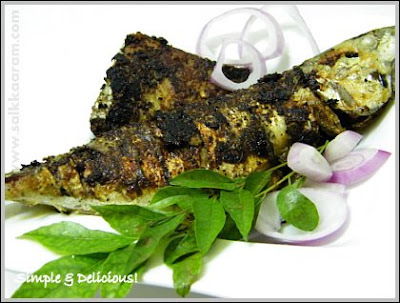 Meen Pachakkurumulaku Cherthu Pollichathu / Fish Roasted Using Green Pepper Corns | Simple and Delicious ! Meen pollichathu , may be every non vegetarian's delight, which has got a top place in the five star menu. Fish marinated in a spicy, tangy, thick masala, wrapped in banana leaf and placed in greased earthern wares (manchatty) and cooked in that. 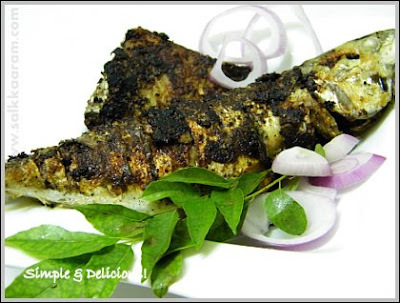 There are lots of different recipes for making meen pollichathu, some says to fry fish slightly on both sides before wrapping banana leaves. I tried to make it using the recipes collected from magazines, especially with green pepper corns, which are so spicy. I haven't used banana leaves for making this and shallow fried it using very little oil. Take ingredients more or less according to the size of the fish fillets. Make a paste of all,marinate fish fillets with it. Shallow fry them in little oil. Cook covered on a low flame. ho,kothichu marichu ..thats so yummy..mathi aano athu ? njan mathi kazhikkilla..but seeing this,drooling..Seens,aa pachakkurumulakinte flavour and smell is reacing here..
beautiful pic and its making me drool here.Like the way your blog looks now. This sounds delicious. Spices must really flavor the fish. Yum! Looks lovely and yummy! The fish must have been really tasty and spicy!